This past Tuesday night, I was camping in Mizell Prairie in the Okefenokee National Wildlife Refuge. There is little dry ground to camp on in the swamp, especially in the wet prairies, so you camp on platforms. It had rained hard that day, starting about 3 AM. In the afternoon, as we approached the campsite, the rain tailed off and the clouds were beginning to break up. I was hoping we’d have a spectacular sunset, for our location looked out over water and grass, with little to block our view. But I was disappointed. Thirty minutes or so before sunset, clouds filled in on the horizon and the sun slipped behind them. We finished our dinner and was cleaning up, preparing for the night, when it all of a sudden it happened. It wasn’t a sunset, but the sky became pink and purple as the sun’s rays, from below the horizon, lighted the low clouds. In the mountains it’s called “Alpine Glow.” The color of the clouds reflected off the waters. We watched in awe as the light faded from the skies. After about ten minutes, the magic disappeared and soon the stars and a waxing new moon were visible. We live in a marvelous world. I am starting a short series in which we’re going to look at the opening three chapters of scripture. These chapters, I believe, invite us to stand in awe before God the Creator. 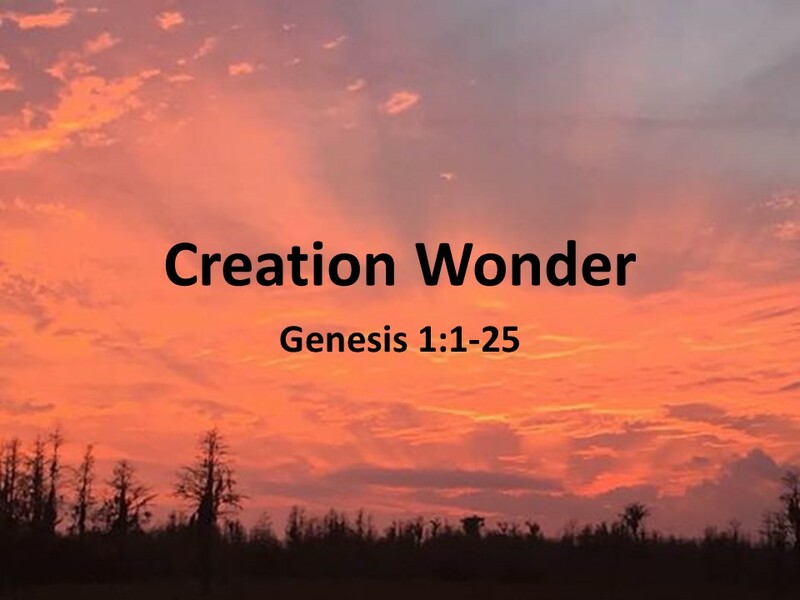 Today, we’re looking at the first part of Genesis 1. Let’s listen to this well-known passage of scripture as I read from The Message Translation. I could probably spend all four Sundays of this series with this passage! It’s so rich; there is so much here for us to ponder, for us to dig into as we strive to understand God and our relationship to him. Instead, I am going to preach more of a brief homily on this passage as our time is short. It is generally accepted by scholars that this passage was written down in its final form after 587 BC, after the temple in Jerusalem had been destroyed and the Hebrew people had been herded off into exile in Babylon. The Hebrew people had lost their homeland, their identity, and now they were in a new land where the people worshipped different gods and had different creation stories of their own. In Mesopotamian, the creation myth centered on the god Marduk, who slew the gods of chaos as he claimed his power over the universe. Marduk’s creation was violent; it was one of conquest. On the other hand, the Hebrew story has God creating by speech. There is no conflict, it is all orderly and done as God commands. 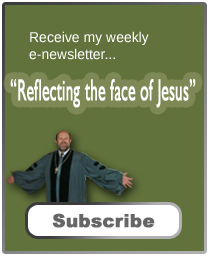 We begin with all that is consisting of a chaotic void, a soup of nothingness that is brought to order when God speaks. On day one, God creates light. Light is associated with God, as we see in the opening of John’s gospel where Jesus is the light coming into the world. God creates light and then separates light and darkness. To show God’s mastery over creation, the light he names day, and the darkness is named night. The ability to name implies power over something and this story of creation is showing God’s power over the universe. The first three days, God is preparing the world for what will come later in the week. Time is created in day one; the heavens and the earth in day two; the land and sea on day three. Although creation is now half done, there’s nothing to inhabit it. Paralleling the first three days of creation are days four through six. On day four, the heavenly lights, are created. It doesn’t take a rocket scientist to raise the question about light, which we think of as coming from the sun. But we learn that the true light comes from God. In fact, the sun and moon and stars are demoted to keepers of time. The text doesn’t even use the name “sun” or “moon.” In the ancient Near East, religion was steeped with astrology and these heavenly disks and dots of stars were seen as a way of understanding what was to happen. The sun was often worshipped. But the Hebrews debunked any powers associated to these bodies. The sun wasn’t to be worshipped and the stars wasn’t to be seen as a source of knowledge about the future, for as Jesus says, that’s in God’s hands. Throughout the Old and New Testaments we are warned against predicting the future and reminded that it’s all in God’s hands. Isaiah tells us that God makes fools of those who attempt such feats. The world and the future is under God’s control. On days five and six, the earth is populated with animals that fills up the lands and the sea and the sky. At the end of day six, which we’ll look at next week, human beings are created. As each act of creation is completed, it’s as if God is a craftsman who steps back to get a good view of his creation, and then proclaims it good. Interestingly, God doesn’t declare that creation is perfect, only good, perhaps because creation is ongoing. But it’s still under God’s control. This passage is written in a sterile, straight-forth manner, with mathematic precision. Seven days, eight acts, ten commands. The word “earth” or “land” appears twenty-one times while the word God appears thirty-five times, both multiples of seven. Seven, of course, represents holiness and this passage invites us to wonder in amazement at God’s creation, which is good and surrounds us. We are to be in awe of the variety of plants and animals, birds and fish. And if we contemplate for just a minute on how amazing all this works—from the planets spinning around the sun to the incredible ways our bodies are knit together, we should be amazed and humbled, grateful and thankful. We worship an incredible God, and what is really amazing is that God thinks we’re special, as we’ll see next week. Amen. William P. Brown Sacred Sense: Discovering the Wonder of God’s Word and World, (Grand Rapids: Eerdmans, 2015), 16. Donald E. Gowan, Genesis 1-11: From Eden to Babel (Grand Rapids: Eerdamns,1988), 22. Gerhard Von Rad, Genesis (1972, Philadelphia: Westminster,1973), 55-56. Isaiah 44:25. See also Deuteronomy 4:19 and Colossians 2:8-10.